Only one place to start this week in review, and that is in Libreville where Zambia defeated Cote d’Ivoire on kicks from the spot at the end of extra time. I remember reading about the Zambian air tragedy when their entire soccer team went down in the Atlantic after taking off from Libreville, and was it was interesting that Soccernet.com picked up on this before the tournament and interviewed Emmanuel Mayuka who became Zamibia’s talisman during the tournament. It is terrible that the tournament was not shown on American television, as the story lines in the tournament would have made for a great example of an African redemption story. 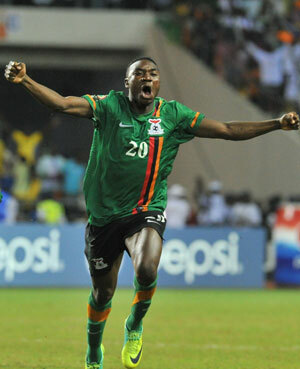 So, I found myself rooting for Zambia on Sunday, despite telling anyone that would ask (and some that didn’t) that this was Cote d’Ivoire’s year to win the Africa Cup of Nations. In the end, the braver team won (but perhaps it was preordained?). If you looked into the eyes of the Ivorian penalty takers, they were scared to miss more than the Zambians. Now, Drogba’s missed penalty in normal time certainly didn’t help the confidence, but in the biggest game on the African continent, you have to be ready to psych yourself up to take a kick from the spot. Anyone could see that Gervinho kept looking to the ground, and made no eye contact with anyone during the kicks. Some might say that when it comes to the 9th taker, you can’t blame the guy because he was forthright in saying he didn’t want to take a kick. But when you’re a star player on the 15th ranked team in the world, you need to be ready to step up in the crucial moment for your country…. Below is a breakdown by The Economist on the possible influence (or lack thereof) by European based African players. As a researcher at the Center for Public Diplomacy, I came to appreciate the need and the convenience of a timely recap of the news. With so much going on in many different fields, and various mediums through which to receive and explore news and information, having one source with a quick summary and commentary on the current events is invaluable. The African File will begin to publish a weekly recap of news from the African continent, with a focus on my three areas of interest/specialty: technology, politics, and sport. The weekly digest isn’t meant to cover the biggest news stories, but examine a range of topics that might be interesting for those who are interested in keeping up on events from the continent. It will contain links to the stories so that readers may gain a deeper inside, and The African File will attempt to add thoughtful, or at least satirical, commentary to the news each week. It will publish under the title: ‘The Week That Was’ (TWTW).